Breakfast cereal manufacturer Kellogg’s has responded to the recent accusation by consumer group CHOICE, which claimed the cereal manufacturer had “refused” to include Health Star Ratings on its products. Kellogg’s now says it is looking at a number of ways to reduce sugar in its portfolio. The Company has now indicated that it has several “exciting new offerings” in the pipeline. 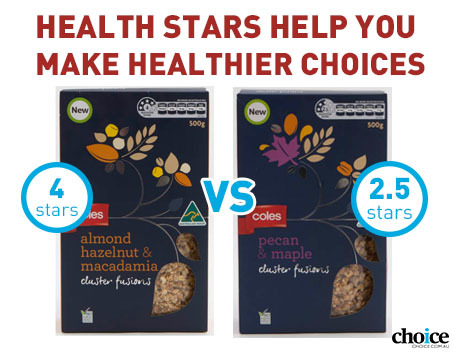 CHOICE launched a campaign yesterday calling on Kellogg’s and six other food manufacturers to roll out the front-of-pack Health Star Rating on their products. The CHOICE campaign is targeting some of the biggest food manufacturers in the Australian market — Kellogg’s, McCain, Mars, PepsiCo, Mondelez, George Weston and Goodman Fielder. It calls on its follower consumers to begin contacting the companies demanding that they adopt the government-sanctioned (but voluntary) Health Star ratings scheme be displayed on their products. The Health Star rating scheme is a pictorial label that was developed by government and public health and consumer experts with the co-operation of some food companies to help shoppers quickly compare the ‘healthiness’ of products. The Star rating takes into account the amount of salt, sugar and saturated fat in products per 100 grams. Its algorithm has not been publicly released but food companies are being invited to use the Health Star Rating calculator on a government website. So far, the two major supermarkets Coles and Woolworths have included Health Star ratings on their private label products. Sanitarium, Nestle, Uncle Tobys and Lion have also all begun rolling out Health Star ratings on some of their products, with more on the way. “Food manufacturers have been on notice since June last year to implement the new health star scheme however iconic brands such as Kellogg’s, McCain and Mars are still refusing to serve up the information consumers need,” said Tom Godfrey, CHOICE spokesperson. Six of the seven companies mentioned by CHOICE have their headquarters in the US. Mr Godfrey said the system worked best when shoppers could compare several products in a category, “like-for-like”. “For example, right now you can walk down a breakfast cereal aisle and see a range of health stars already on different brands, but there are some obvious gaps,” Mr Godfrey said. “It’s just not good enough that a major player like Kellogg’s, that sells popular brands Just Right, Special K, Coco Pops and Nutri-Grain, are withholding basic health information and that’s why we have launched this campaign,” he said. Mr Godfrey said Kellogg’s should be “embracing the new system and celebrating the fact that Just Right and All Bran receive 4 and 5 stars respectively”. “On the flip side, Australians deserve to know that Nutri-Grain and Coco Pops get 2 and 1.5 stars respectively,” Mr Godfrey said.